Ominous sign for the White House: Former Trump Security Advisor admitted guilt today in federal district court to lying to the FBI about his contacts with Russian Ambassador Sergey Kislyak. Court records indicate he was acting "under instructions from senior Trump transition officials." Flynn is cooperating with Mueller. Said Flynn, “My guilty plea and agreement to cooperate with the Special Counsel’s Office reflect a decision I made in the best interests of my family and of our country. 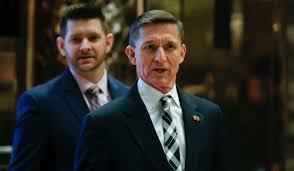 I accept full responsibility for my actions.” Best interests of my family ... namely, Michael Flynn Jr., who was very involved too? Flynn was passing requests to the Russians, and the Russians were sometimes complying, like in not too vigorously protesting the Obama administration's sanctions over election meddling in certain hope of seeing those sanctions lifted under Trump. “A very senior member of the Presidential Transition Team” asked Flynn to make contact with the Russians (and other foreign persons), and they received reports on those contacts. Some observers now consider that Trump himself has a legal exposure problem.